Banking operations were last week temporarily disrupted at the regional head office of Fidelity Bank Plc located on Kudirat Abiola Way, Oregun, Ikeja, Lagos. This was as a result of a demonstration carried out by some aggrieved employees of the financial institution, who expressed disgust over a policy put in place by management of the bank, which they described as insensitive to the welfare and unsympathetic to their course. They conveyed their anger through various placards with inscriptions like ‘No To Impunity at Fidelity Bank Plc’, ‘Pay Us Our Entitlements, Fidelity Bank’, ‘Enough To This Wicked Treatment by Fidelity Bank’, ‘Fidelity Bank, We Worked For This Money’, Pay Us Our Ex-Gratia, Fidelity Bank’ among others. 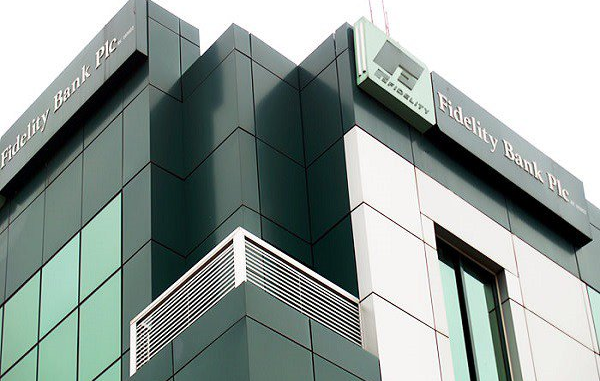 The protesting staff of Fidelity Bank said they were not happy with the lender’s Managing Director, Mr Nnamdi Okonkwo’s arbitrary policy change and draconian approach to disengagement of some staffers of the bank without caring about their after service survival. This group of dismissed staff has been protesting the non-payment of their entitlements by the bank’s administration after their ignominious sack from the bank to which of them have dedicated years of service. They claimed an order came from Mr Okonkwo to terminate, with immediate effect, their appointment due to the bank’s unexpressed need to prune its work force, which is not uncommon in Nigerian banking industry. But having their appointments terminated without their entitlements and gratuity would not be tolerated from the bank, they submitted. Speaking on behalf of the protesters, Mr Eluwa Innocent, who is one the affected staff, said that the protests had become necessary as a result of “undue maltreatment” suffered by them by being denied their entitlements. “The new Bank MD, in person of Mr Nnamdi Okonkwo, brought in a new and draconian policy into the bank’s system and denied us our gratuity and entitlements. “Not only did he deny us, he started laying off people unlawfully and indiscriminately without any regard or recourse to the number of years some of us had put in,” Mr Innocent said. “We demanded that this is not how it is being done, and even at all he has a new policy in place, all we want is our entitlements and nothing more,” he fumed.